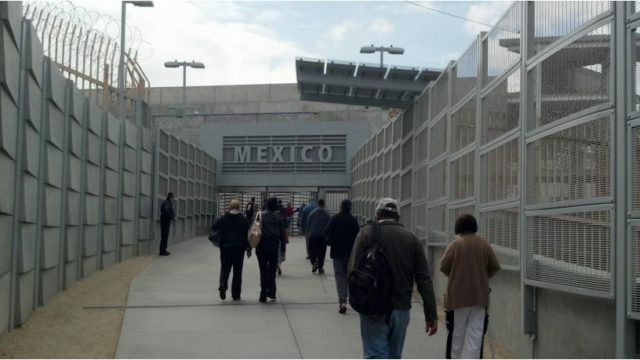 A major upgrade for pedestrians crossing the border at San Ysidro will open to the public on July 15. The new “PedWest” crossing has 12 northbound lanes and two reversible lanes. It will connect with the new Virginia Avenue Transit Center for taxi and bus connections. The existing, often congested pedestrian crossing on the east side will continue in operation, but be reduced from 14 lanes to six to accommodate construction for expansion of the port. PedWest will be open 24 hours a day, seven days a week to process northbound travelers into the United States. The General Services Administration is in the midst of a major expansion of San Ysidro that will be complete in 2019. “The PedWest facility provides the additional pedestrian processing capacity needed to support the region while GSA moves forward with the next phase of the port’s modernization and expansion project,” said Anthony Kleppe, regional land port of entry program manager. San Ysidro is the busiest land border crossing in the Western Hemisphere. Over 70,000 northbound vehicle passengers and 20,000 pedestrians cross the border daily.